When there’s TONS of work to be done, work smarter with our app! With Maren’s Optional Smartbale Mobile Remote interface you can monitor and control the operation of your ProPak two ram baler with a portable full color touch screen. Easily monitor bale size and statistics, read massages, clear jams and change materials safely from the seat of your loader. That means your loader operator is now your baler operator too! Hydraulic: A simple but innovative hydraulic system allows the 2R265/2R285 to run faster and more efficiently while being more serviceable. Highly efficient piston pumps rated for 5,100 psi run at only 4,200 psi (2R265) : and 6,100 psi run at only 4,500 psi (2R285) ensuring less stress and long life. All pumps are mounted below tank level to eliminate start-up cavitation and extend pump life. Platen Force: (2R265) 267,192 lbs. : (2R285) 286,277 lbs. Platen Pressure: (2R265) 156 psi. : (2R285) 167 psi. Maren’s SmartBale Intelligent baler control allows password protected saving of a complete set of parameters for each commodity to be baled. 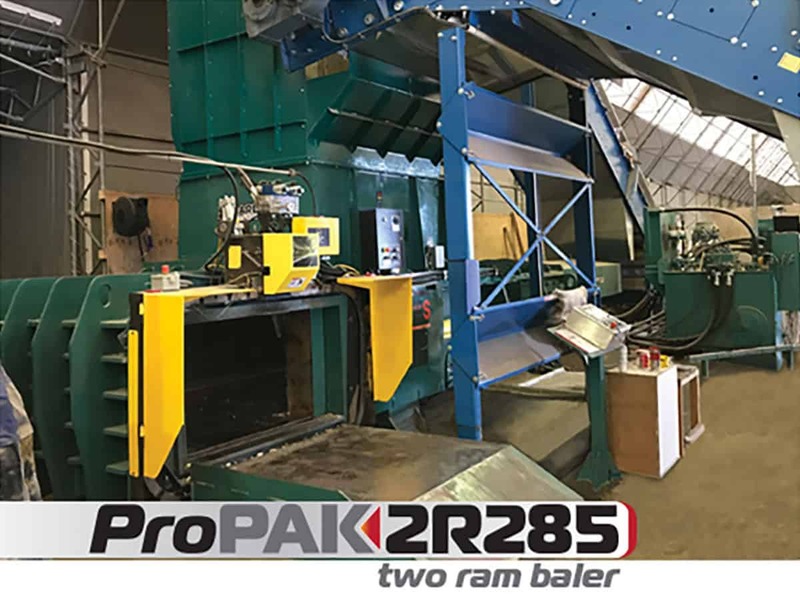 At run time the operator simply selects the proper material from a drop down list and the ProPak 2R265/2R285 automatically configures for the commodity to be baled. Settings automatically adjusted include wire count, wire placement, baling pressure, bale size, photo eye selection, conveyor speed, multi motor settings and many more.